It’s hard to not like Augusta. 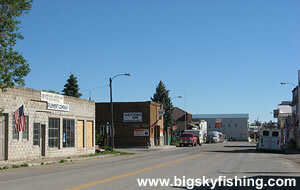 The town is scenic, clean and full of many nice, renovated buildings. Granted, the town is very small, with a population around 300 people and isn’t crawling with services. But for the people who visit Augusta, the town has pretty much everything they’ll need. So why would a person want to visit this part of Montana, and Augusta in particular? Simple. Augusta has a superb setting, being located near the base of the Rocky Mountain Front in Central Montana. Augusta serves as a recreational hub for people who are heading out along the Rocky Mountain Front for camping, fishing, hiking and hunting. Augusta tends to be a sleepy little town much of the year. Although Highway 287 runs through town, few people ever bother to stop or venture much beyond the highway. This changes, though, during the summer and again during hunting season. The Sun River Wildlife Management Area is located just to the west of town. The Wildlife Area serves as a refuge for elk and other wildlife that migrate down from the Bob Marshall Wilderness Area complex. Fishing and camping is also extremely popular outside of Augusta during the summer. Nilan Reservoir and Willow Creek Reservoir both have solid fishing and are very attractive places for camping, as the towering peaks of the Rocky Mountain Front dominate the view. Augusta also serves as a starting point for several scenic drives. The Sun River Wildlife Management Area Byway begins just to the west of town. The Sun River Loop Backcountry Drive is a 46-mile drive that cuts across the Central Montana prairie and passes behind the first mountains of the Rocky Mountain Front. Finally, the Southern Rocky Mountain Front Scenic Drive heads south from Augusta. Overall, anyone who wants to explore the Rocky Mountain Front region of Montana will very much appreciate Augusta. The town has all that’s needed, provided those needs aren’t too exotic!